Welcome to the Mabee Center. This multi-million dollar complex, located in beautiful South Tulsa, contains a multi-functional arena with state of the art production, and concert-quality acoustics. 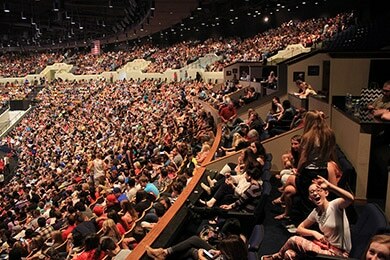 The Mabee Center is a top venue in the Tulsa Area and hosts concerts, sporting events, conferences, banquets, weddings, cultural programs, and more. With 105,000 square feet of floor space and the ability to seat up to 11,300, the Arena is ideally suited for a wide variety of small and large-scale performances. Equipped to accommodate any type of event, the Arena features a modern line array speaker system that can enhance the sound of all stage productions. The technical expertise and dedication of the Arena staff ensure that everyone from the artist to the fans have an event experience they will never forget. A wide varitey of microphones are availible. Please call (918) 495-6413 for more information. Maximum rigging truss height (depending upon configuration): 38 ft.